PLANE food is often a disappointing and soggy mess - but it's rare to be served a dish that spans the decades. 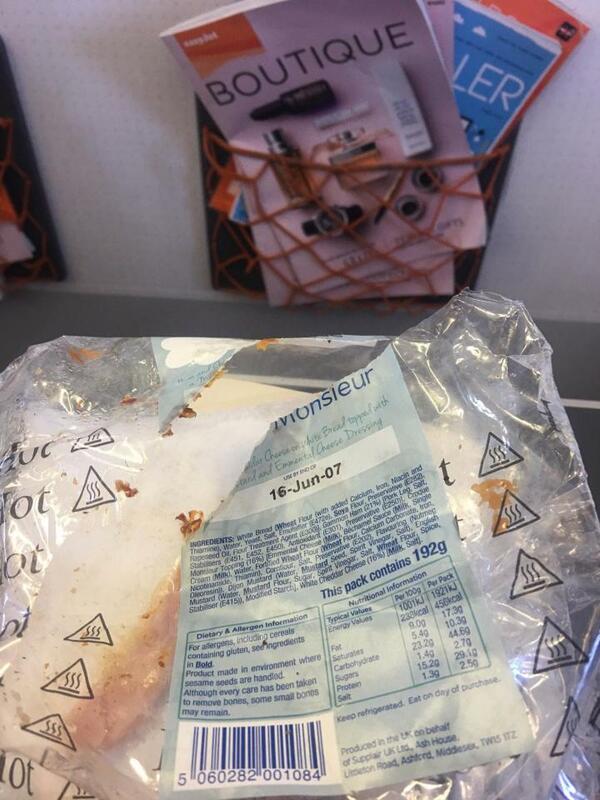 So a passenger on an easyJet flight was stunned recently after he was served a sandwich labelled ten YEARS out of date. Adrian Bell, 59, was returning to the UK from a holiday in Zante with his wife, Lindsey, 42, when he purchased the cheese toastie. He looked at the snack and realised that the date read June 16, 2007 - nearly ten years out of date at that time. But easyJet insists that the item was not out of date, but instead was labelled incorrectly. When Adrian, a father of one from Wrexham, Wales, noticed the date on his toasted sandwich, he instantly complained to staff on the flight. He claims one of the flight attendants then quipped: "We should charge you more, it's an antique". Adrian said: "I was flying back to the UK after a family holiday on June 15 when I was served the sandwich. "I told staff on the plane about it and they said it wasn't out of date - but they were just looking at the day and month, not the year." He continued: "The date on the back read 16/06/2007, that's ten years out of date. The flight staff said that no one else had complained. "I've been writing to customer service but they just don't answer. It was dangerous serving it, we don't know how long it's been frozen for. ''I told them and they carried on serving them, so I started telling the other passengers on the plane. "It was still really tasty, to be honest, but it was over cooked." But easyJet this morning insisted that the sandwich was still in date, and the confusion came from an incorrectly printed label. A spokesperson said: "We have looked into this with our in-flight partner and they have confirmed that this sandwich was in date. "This was obviously a manual printing error and we are surprised that anyone would think it was anything else."